Are you ready to survey? Attention Washington State Beekeepers, in past years your State Beekeeping Association conducted its own winter loss survey along with Oregon State Beekeepers. To better gather the data needed to actually help, we now support the Bee Informed Partnership. Please participate in this years survey of all beekeepers. The Bee Informed Partnership (BIP) is a USDA/NIFA (U.S. Department of Agriculture/National Institute of Food and Agriculture) funded project with the stated goal of reducing colony losses. 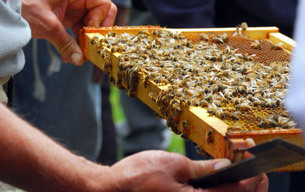 The program is a collaboration of research institutions, Universities and beekeepers in the US. It is now time for your active participation! BIP and the nation’s beekeepers, cooperatively seek solutions to reduce colony losses. While some beekeepers are experiencing near normal loss levels, others are experiencing devastating losses. BIP seeks a collective approach to gather and share information on what works and what doesn’t work. We need your participation on two annual electronic surveys, covering both annual colony losses and management strategies. The information, after coming directly from beekeepers, is then analyzed and displayed graphically in a way that is easy to understand. Beekeepers can find out which management techniques correlate to lower colony loss when beekeepers anonymously share data. More data is always more accurate than less data. Last year’s survey included over 5,000 participating beekeepers sharing information. As the third year of these surveys approaches, the goal of the partnership is to increase participation and report it so it is more significant and meaningful to beekeepers. This third year of data will enable us to conduct multi-factorial analysis and report results on a more regional basis; especially in states with large participation. Commercial beekeeper data will be separated to highlight this group’s special needs and concerns. The cost for participating is free. It will take less than 20 minutes to take both surveys. In return, you will have access to the compiled data from all aspects of bee management. The information you enter into the survey is completely anonymous deigned to improve everyone’s beekeeping success.